A dangerous driver who sparked a terrifying high-speed chase with police has been jailed. Derby Crown Court recently heard how Lewis Hobley accelerated at up to 90mph while taking a number of blind summit hills during the 10-minute pursuit. Pictured is Lewis Hobley, 21, of Kingsley Avenue, Chesterfield, who pleaded guilty to two counts of dangerous driving and driving while uninsured and without a valid licence and was jailed for one year. He overtook one car that was already overtaking, mounted a pavement and a grass verge and left a trail of debris as he fled from police. The 21-year-old stopped in a scrap yard where he tried to run but was detained when a police officer pulled out a stun gun. The court also heard that just a month later, Hobley sped from a red light in a second chase that saw him narrowly avoid knocking a cyclist over as he tried to escape from police again. Recorder Jacob Hallam QC said: “This was a prolonged period of bad driving at excessive speeds on busy roads during which you showed total disregard not only to the safety of yourself and your passenger but all the other road users. “It was frankly really extraordinary that you or other people on the road were not injured. The hearing was told how the two incidents took place just a month apart in the summer of this year. Abigail Hill, prosecuting, said the first offence happened near Chesterfield at around 5.30pm, on July 26. She said police spotted Hobley driving a car and decide to follow him. Describing the 10-minute chase that followed, Miss Hill said: “He accelerates to speeds of up to 90mph taking a number of blind hills, sometimes on the wrong side of the road when it would be almost impossible to know if anyone was travelling towards him in the opposite direction. 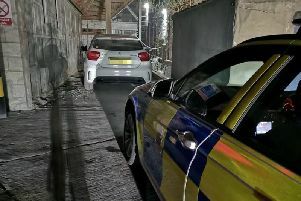 Miss Hill said he fled from his car, was pursued on foot by an officer who drew his Taser to bring the offence to a stop. She said after being released while under investigation for that offence he carried out the second piece of dangerous driving on the A617 Hasland Bypass coming into Chesterfield in a different car on August 29. Miss Hill said Hobley jumped a red light and accelerated away at speed before narrowly avoiding a collision with a cyclist at the Alma Leisure Park. Father-of-one Hobley, of Kingsley Avenue, Chesterfield, pleaded guilty to two counts of dangerous driving and driving while uninsured and without a valid licence. Joe Harvey, defending, said his client’s offending came at a time when his best friend had taken his own life which sent him off the rails. He added: “He is experiencing his first taste of adult custody at Nottingham Prison which he describes to me as a zoo. “It is a regime he has not enjoyed at all and anyone who thinks Nottingham Prison is a holiday camp is welcome to talk to Mr Hobley. “He has employment as a car sprayer and recognises that he needs to set a good example to his son. Recorder Hallam sentenced Hobley to one-year of custody and disqualified him from driving for two years and five months.